Welding is an incredibly demanding and difficult skill to master. It requires a lot of work to be put in before you can construct a finished product you are even remotely confident will withstand anything more than a sharp breeze. It will give you sore joints, strain your eyes and it will smell to high heaven. But those that dedicate themselves and stick with it throughout the difficult beginning may find that they have developed a useful ability or may even discover a talent for it. Explaining the basics of welding or how to develop your affinity towards it is honestly more than I can do in such a short text, but I can tell you what you will need in terms of equipment in order to start you down the road. 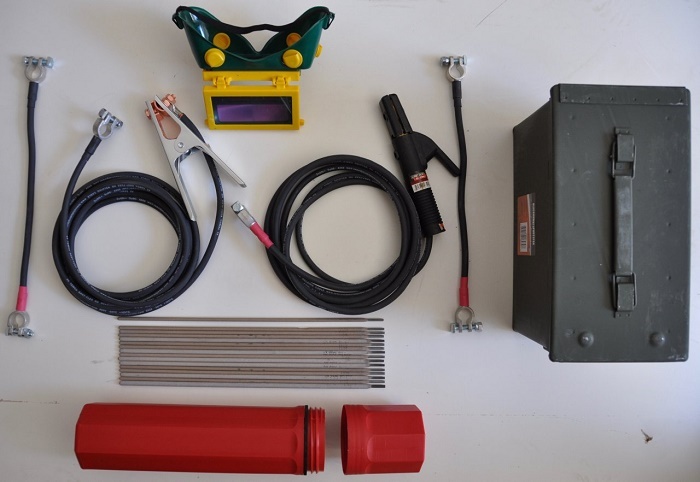 When it comes to welding itself, there are more than enough types of welding kit that are aimed towards professionals and amateurs alike for you to be able to find everything that you might need. The same is true of the safety gear as well, but there are still a whole lot of items that don’t come standard but have a lot of benefits, so you might also consider getting. A good choice of head-gear would be a welding mask with an auto-darkening visor. As its name suggests, it is designed to protect your eyes by adjusting to the levels of brightness and giving you that extra little bit of defence against the bright sparks of the torch. Aside from that, also never neglect to get as many pieces of flame retardant materials to cover as much of your body as you can. Even though most welding safety kits already come with sturdy gloves for your hands, you might also like to get an apron, a pair of boots and if possible some overalls as well. Aside from safety, there are items like the magnets that are used simply because of their versatility and can come in a variety of sizes to match the scale of any project you are working on. There are also a large number of welding clamps that also come in different sizes and are essential tools used to keep items you are welding in place. And finally, there are a few tools used to make a few finishing touches or add a few details like the chipping hammer, the file, and the metal brush. Additionally, you should also look into a few high quality precision measuring tools as well. I personally recommend getting a soapstone which is a marking tool that is remarkably durable to high temperatures, a sheet metal gauge so that you can determine the exact thickness of the metal you are working with, and a speed square for marking angles. All of the items I’ve mentioned will serve you well in the long run, but if you are just starting out, then you can make do with a basic welding kit and work it out from there. It’s important that you don’t rush and exhaust yourself early by taking on more that you can shoulder, but simply allow yourself to make mistakes for now and resolve to learn from them.